Hi everyone! I’m going to be one of the featured authors at a local author meet and greet being held at the wonderful independent bookstore, Mysterious Galaxy. The event is being held on Saturday, March 30, 2019, and it starts at 12:00 PM. If you are going to be in the San Diego area, please consider dropping in to hobnob with some great San Diego area authors. I just wanted to let everyone know I’ve got some new apparel available through Teespring. I’ve created a hooded sweatshirt, and a T-shirt featuring a large, beautiful Cthulhu image right on the front. The T-shirt sells for $25, and the hoodie sells for $35. There are many color options to choose from. And, they make great gifts! All weekend long I’m discounting The Abhorrent Abecedarium. It is now on sale for just for $14.00 for a signed edition! It’s the perfect holiday gift for all those H.P. Lovecraft fans in your life. It may not be known to everyone visiting this site, but I wrote a book before The Abhorrent Abecedarium that has nothing to do with H.P. Lovecraft. It’s an original fairy tale, with some nice pencil art, called The Story of Milk Thistle. And, it’s free to download and read from Barnes and Noble and iTunes. I invite you all to download it, and enjoy! Thank you. Hi everyone! I’ve added a new painting to the shop. It’s a watercolor and ink painting inspired by the original Legend of Zelda video game. It’s painted on a 12” x 9” bristol board. It comes in a basic black frame. Be sure to check it out! Hello, and welcome to my updated website! I've finally got an acceptable e-commerce platform, and my H.P. 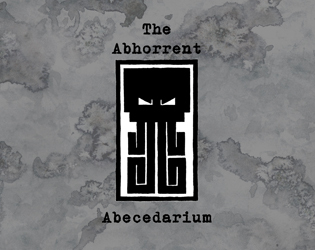 Lovecraft inspired book, The Abhorrent Abecedarium, is now available to order! In the future I plan on making original art, and commissions available for purchase as well. I also plan on regularly updating this blog, and posting more art to the Art page. So come back often!